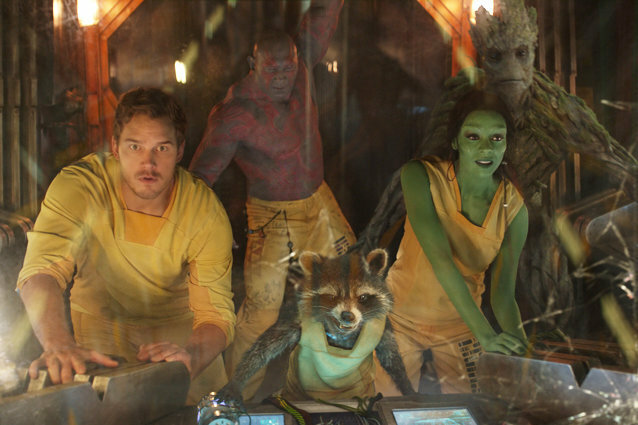 What Are Celebrities Tweeting About 'Guardians of the Galaxy'? On the off chance that you’ve managed to avoid the Internet, television, newspapers or other people for the last few months – in which case, welcome back! That one Iggy Azalea song is still a thing and Legolas and the Biebs are feuding now – allow us to remind you that Guardians of the Galaxy opens today. Although, chances are even the most remote parts of the world are still abuzz at the chance to see Andy Dwyer, Neytiri, and the Vin Diesel-tree save the universe. As with every major and minor cultural event, Twitter is full of people sharing their excitement, opinions, criticisms and photos of the snacks they got at the concession stand. And even though celebrities might have cooler jobs and better hair than the rest of us, they too are unable to resist the allure of the latest Marvel movie, or the joy of tweeting about it. I have been excited for #GuardiansOfTheGalaxy since @prattprattpratt had a gut and @KarenGillan2 had long hair! CAN’T WAIT @JamesGunn!!! Guardians of the Galaxy is the best one. I loved GUARDIANS OF THE GALAXY. It’s funny and has heart but the big revelation was how great @DaveBautista is as Drax. Let’s talk for a second about @leepace in #GuardiansOfTheGalaxy. Flawless. That is all. Go follow him. Before everyone else does. And there was absolutely nothing that could potentially cause people to overreact and start reports of a feud. Nothing at all. You can catch Guardians of the Galaxy in theaters everywhere to judge it for yourself. And then tweet about it, of course.